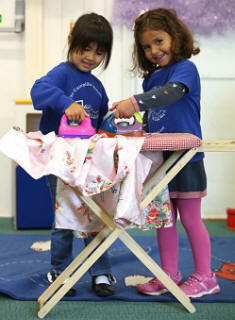 We offer places to children from 2 years old to 5 years old. There is the facility for them to stay until 4.00pm on certain days for different clubs. We currently offer: Drama, Art Attack!, Weird Science and Karate. With children over 3 years we have a staff/pupil ratio of 1:8 and with children aged 2 years a staff/pupil ratio of 1:4. Also included in the curriculum is Show and Tell, Cooking, Art, Singing, Role Play and various activities for Physical Development. We have an Outdoor Classroom area and also regularly go to the park. The School is open in term times from 8.00am (for Breakfast Club) with school beginning at 9.00am – 4.00pm Monday to Thursday and 8.00am – 12.30pm on Friday for 38 weeks of the year. The term dates closely mirror those of other Independent Schools in the area. For complete details see the term dates page. If you wish to register your child at The Caterpillar Montessori Nursery School please complete the Registration Form, see the Registration page. The free entitlement is available through the Ealing Education Authority for all three and four year olds attending Caterpillar as their main nursery school provider. Your child becomes eligible for the grant the term after they have turned three years old. These are some of the vouchers we currently accept: Edenred, Busy Bees, Care-4, Sodexho, or individual employer schemes as payment of our invoice.